One of the most interesting new features to come with iPhone 3.0 OS is Find My iPhone. What do you do if you lose your phone? Well, you certainly wouldn’t want to risk someone getting their hands on your personal information, right? So, if you happen to lose your iPhone, you can now log into your MobileMe account and you will see where your device is on a map. Then, you can send a message to the phone, which should let people know that this is a lost iPhone. It can also play an alarming sound. Another nice option is that you can send a wipe command that will erase all your data. 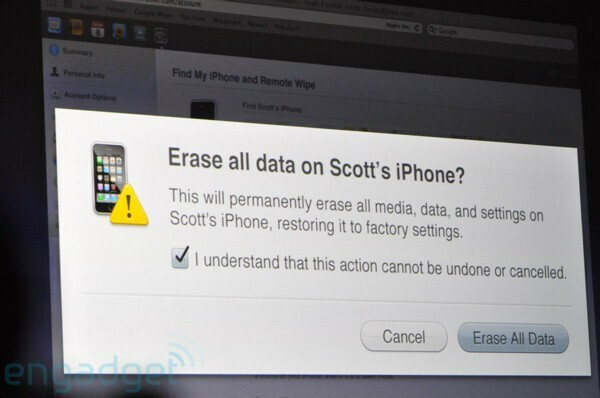 You can always restore your data later, when you get your phone back. Tethering will also be available via USB and Bluetooth (for both PC and Mac), but will require carrier support and AT&T will not have it for the moment. Language support has also been increased and now more than 30 languages are supported by the platform. For more features – check our iPhone 3.0 OS preview. The new platform will be available, starting June 17 for free for the iPhone and at a price of $9.95 for the iPod touch. *UPDATE: Apple has just announced the new iPhone 3GS. Check our news story here! That's pretty funny that the nonremovable battery actually (indirectly) has a "pro"
I agree, although it technically can be removed if it's stolen. It's also nice you can clear the personal data too. Simple things but something noone else has.